So here I am talking about the famous how to save money on fresh fruits and vegetables again! It is not an easy thing to do. You want to eat healthy and coupon! HA! Well I am doing my best research to allow you to do this! Here is a list of a few things that I have come up with to help you save some money. Check the weight of pre-packaged produce. They sell these bags at so much per bag but if you take a few bags to the scale and weigh them you will be surprised at the difference. If the larger pre-packaged bag of produce is the cheapest route try to find one that doesn’t have any bruised goods inside. If they all have one bad one then immediately dispose of the bad one as soon as you get home. Have you ever heard that saying “One bad apple can spoil the whole bunch!” Well it is true! 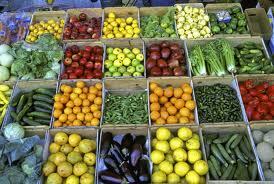 Buy fruits and veggie’s when they are in season (see here). Try checking your local farmers market or road side stand. They are often cheaper than stores and I often find that I am happier with the product. To get the best value, store produce properly after your purchase. If fruit is a little under-ripe place in a paper bag for one or two days and it will be ready to eat!! When buying produce by the pound make sure it is dry. Wet produce will weigh more and essentially cost more money! I hope that helps out with trying to save money on produce. It is hard but not impossible!